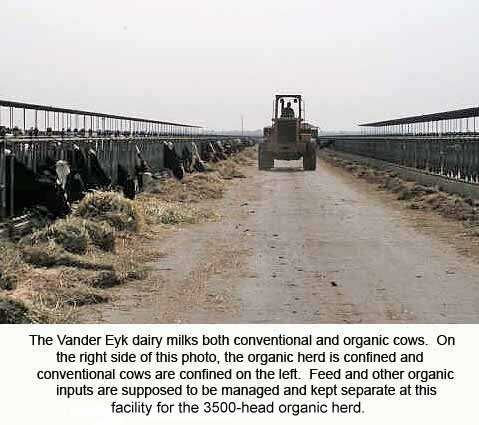 The Case Vander Eyk Dairy, which reportedly said it was seeking recertification of its 3,500 head organic herd, has decided not to pursue it after all. The controversial dairy in the Central Valley of California had been certified by Quality Assurance International, but QAI suspended the company's organic dairy operations in May for failing to meet regulatory standards. The dairy then approached California Certified Organic Farmers about beginning the recertification process. Peggy Miars, executive director of CCOF, one of the oldest organic certification agencies in the nation, said in an email the dairy was in "the initial review stage" for recertification. "Obviously, CCOF holds all applicants to the same strict standards and would ensure that all previous noncompliance issues are resolved." "However, that seems to be a moot point based on my conversation with our contact at Vander Eyk," Miars continued. "He said that the Vander Eyk family is pulling out of the organic dairy business indefinitely." Vander Eyk plans on getting CCOF to recertify its pasture as organic but run the dairy as a conventional operation. Presumably, this would give Vander Eyk flexibility to return to organic in the future, since a farm must prove that its pasture was farmed organically for three years before it can win certification. Certifying a conventional dairy herd as organic, however, only takes one year. The farm had what was known as a "split operation," with 10,000 organic and conventional cows. The operation had been criticized by the Cornucopia Institute, among others, for minimizing pasture on its farm. To recertify its pasture, it will have to submit a "farm plan" that lays out its organic practices in detail, correct any non-compliance issues, pass certification inspections, and be reviewed by the USDA.